Welcome to a lovely, sunny Worcester. 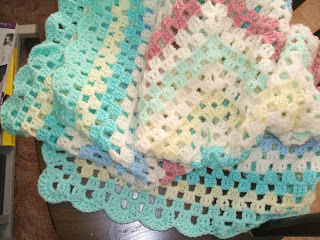 It was too hot for me to go out earlier today, so I finished off this blanket for Esther's baby shower this evening. It's made with three trebles, one chain, for the main part, and a scallop of 7 trebles in one hole, 1sl st, for the border (like the one in my cushion - see Granny Meets Cath K post earlier). It worked best with 11 trebles in one hole for the corners. I've just made a start on a new kina pattern (again see earlier post). 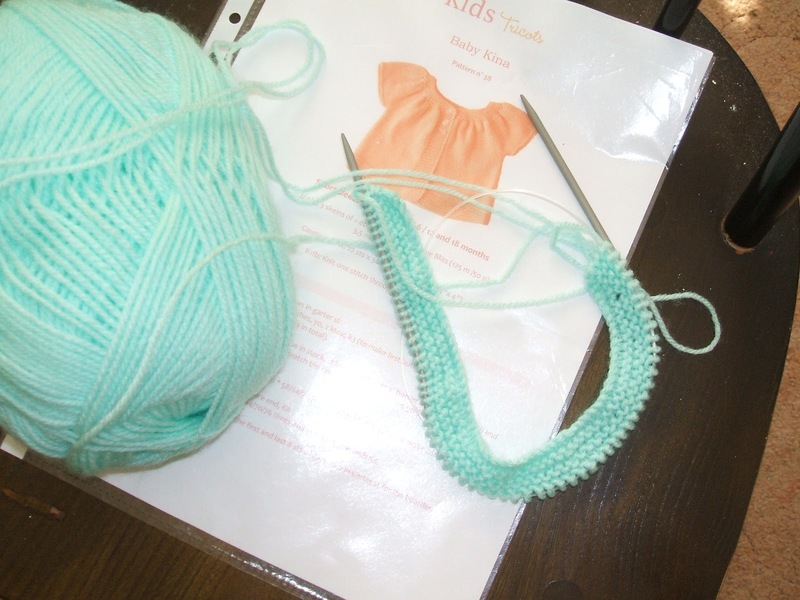 The smallest size on the pattern says fits 3 months but I think I must knit rather big, so as each size went up by 6 stitches, I'm doing this 6 stitches smaller than the pattern. I'll let you know how it works out. It has been very hot here (at least for me!) so I worked in the shed, where it was nice and cool-ish, potting up tomatoes and peppers and, when some cloud cover came over, dashed out to put the runner beans in, and gave them a good drink to cheer them up. I'm posting this on Handmade Monday over at http://handmadeharbour.blogspot.co.uk/2012/05/handmade-monday-68.html so mosey on over and see what everyone else is up to. Such pretty colours, really lovely. Yep, it has been rather hottbut you managed to crochet the lovely blanket. The little top looks sweet. 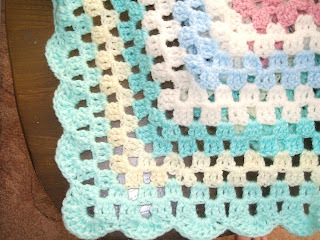 Your baby blanket is lovely - beautiful colours! 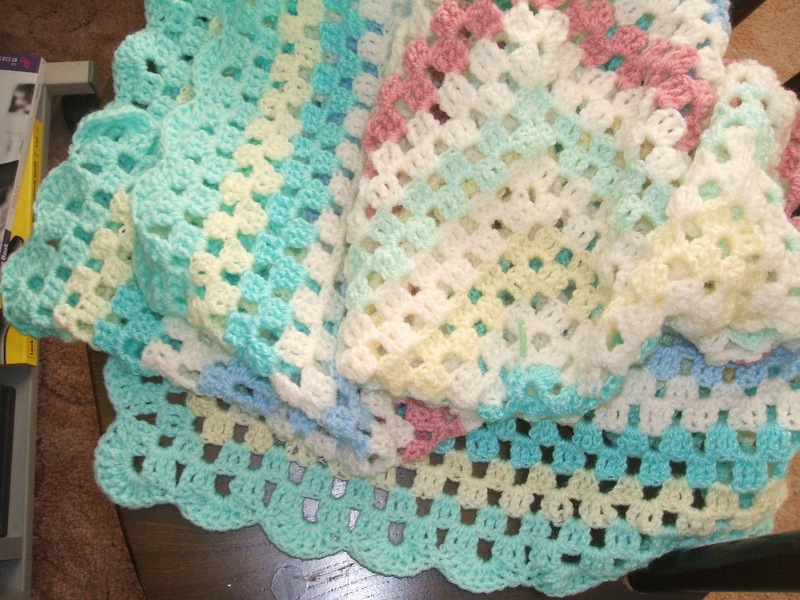 The colours in the blanket are so pretty, especially the turquoise. Gorgeous! I would love to be able to make something as lovely as that! The blanket will be treasured I'm sure. I loved being able to wrap my daughter in the blanket my grandma had made for her when she was newborn. I am sure Esther will be so pleased with the blanket, it is lovely. Cooling down this week so gardening should be as little easier. Hope you have a good week. 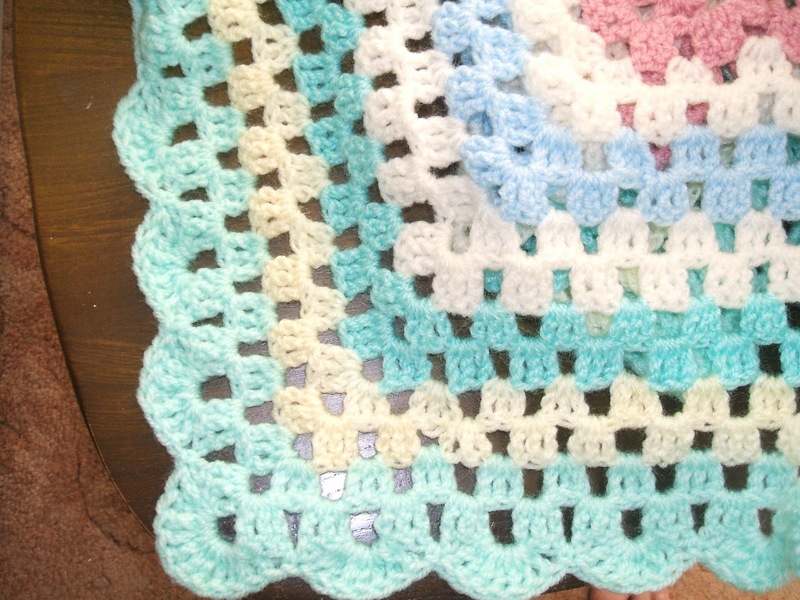 What a pretty blanket to wrap a baby in! The blanket is so pretty. I have this problem with knitting as I tend to knit loose try a smaller needle. Yee-Hah - It's Party Time!